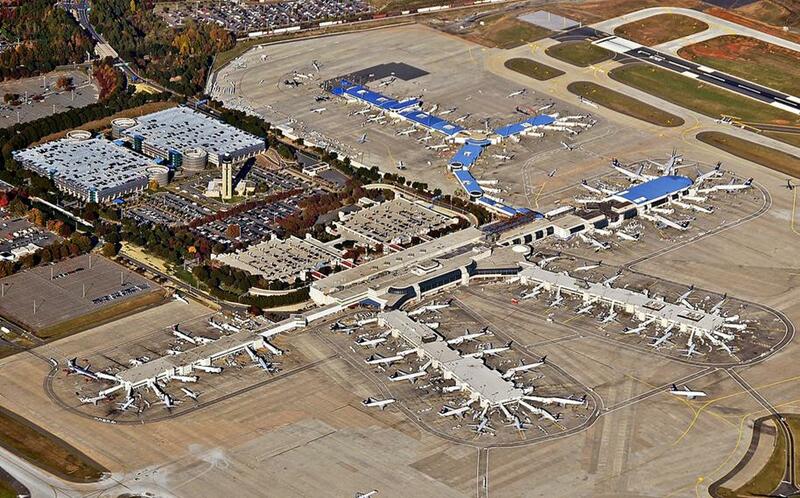 Charlotte-Douglas International Airport is the 7th busiest airport in the world by movements and 6th in the U.S.. 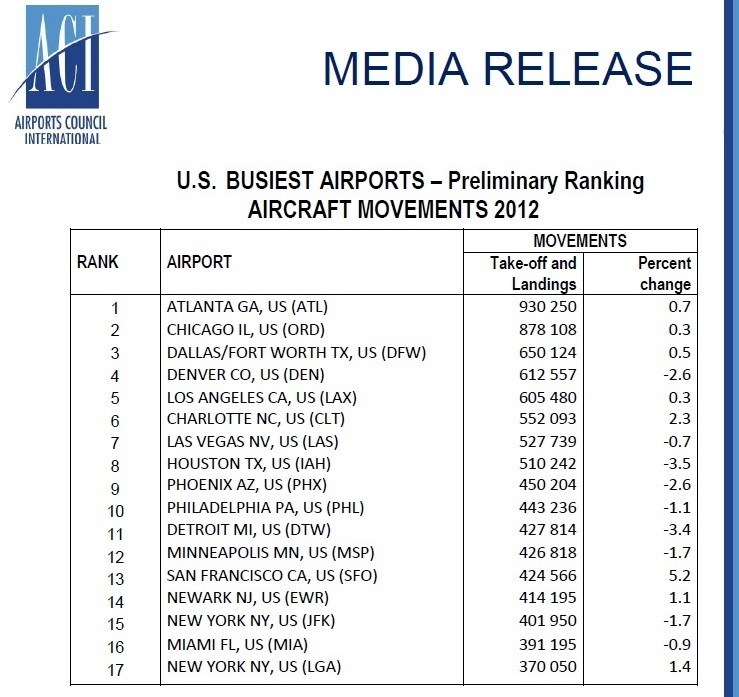 It is also the 8th busiest by passenger traffic in the U.S..
MONTRÉAL, QUÉBEC, CANADA – ACI preliminary traffic results, based on reports from over 1093 airports worldwide, indicate that global passenger traffic grew at a rate of 4 percent while cargo and aircraft movements were flat as compared to 2011. As many as 5 airports in emerging markets with over 40 million passengers reported double-digit growth rates. These airports include Istanbul (IST; +20.6), Dubai (DXB; +13.2), Jakarta (CGK; +12.1), Bangkok (BKK; +10.6) and Singapore (SIN; +10.0). 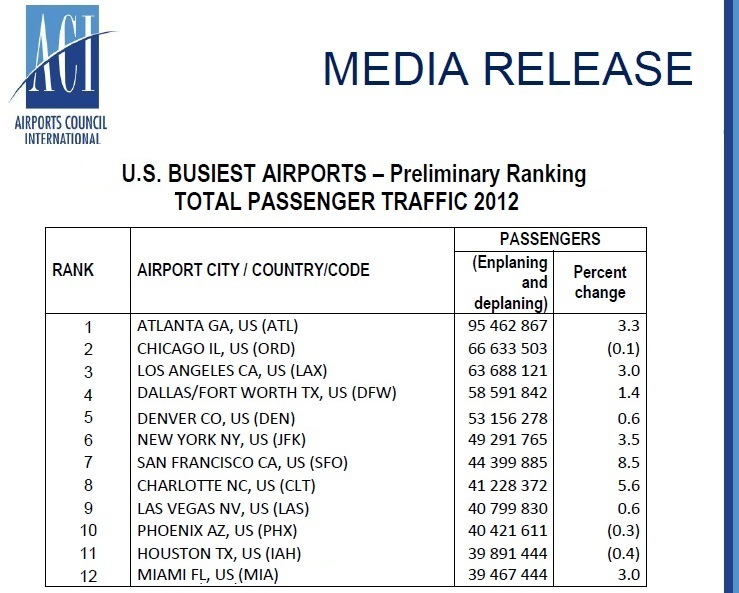 Atlanta (+3.3%) continues to be the world’s busiest airport, while Beijing (+4.1%) maintains second place. 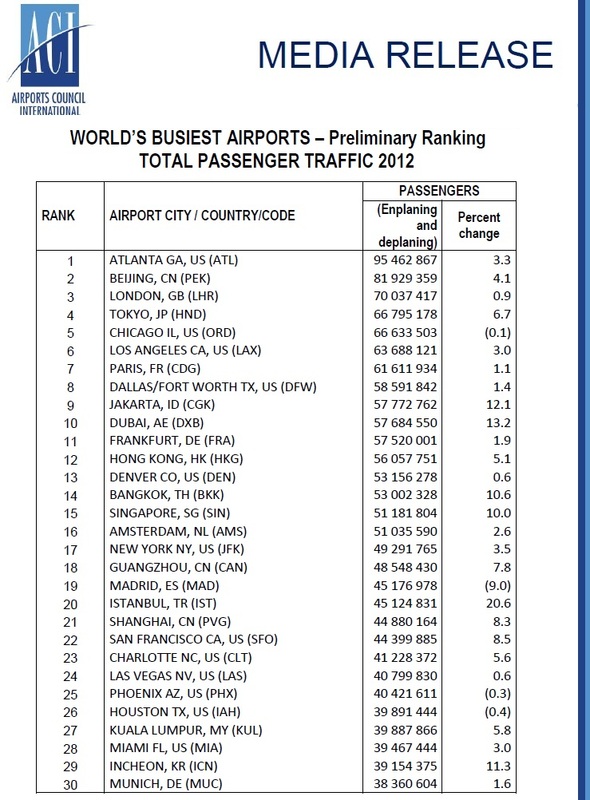 London Heathrow (+0.9%) remains in third while Tokyo Haneda (+6.7%) moves into fourth position. Chicago O’Hare (-0.1%) takes fifth place. 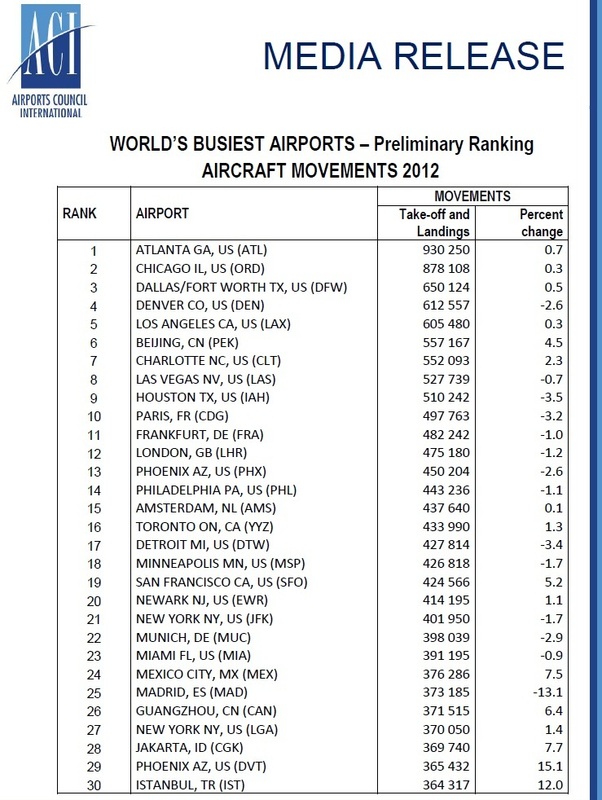 Only three other airports in the top 30 experienced declines in passenger traffic in 2012, which include Madrid (-9.0%), Houston (-0.4%) and Phoenix (-0.3%). 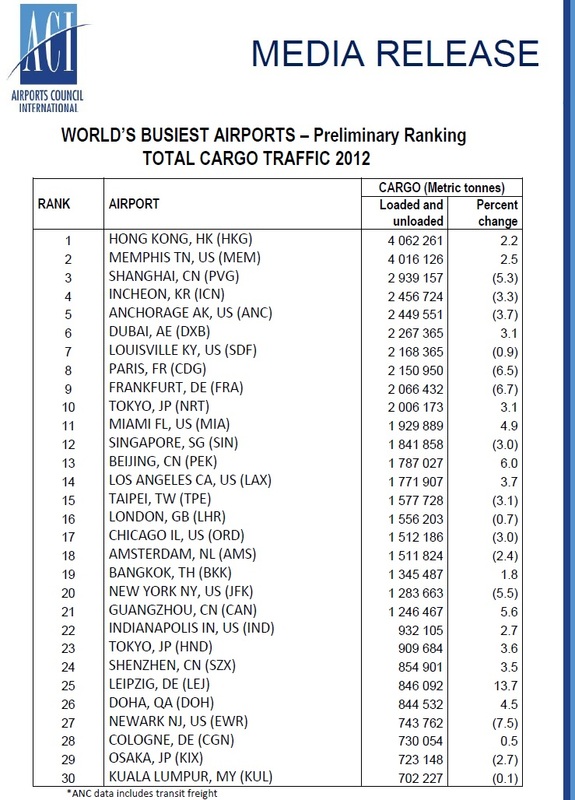 ACI is the only worldwide association of airports. It is a non-profit organization whose prime purpose is to represent the interests of airports and to promote professional excellence in airport management and operations. ACI has 580 members who operate over 1751 airports in 174 countries and territories. Please note that preliminary results are based on the submissions of over 1093 reporting entities. The final confirmed report, which will be published in summer 2013, will include any outstanding airport reports, and therefore figures are subject to variation.